If you’re an SVF regular you’ll know what we’re all about – a festival experience like no other, in a beautiful rural setting, that is completely secure for all campers and only 2 minutes’ walk from the village of Stanhope, with a safe, friendly atmosphere for all ages, and full of lovers of great music, who all want to enjoy a cracking weekend. We've sold out for the last 2 years and SVF North won't get any bigger now, as we want to keep that same vibe that works so well. If you haven’t been before, you’ve missed out for 6 years – so what are you waiting for? Take a look now at 2019 line-ups. If you’re bringing a scooter, there’s the popular ride out and show 'n' shine, with plenty of trophy categories on offer, and if you’re not, there’s still over 15 hours of brilliant live music to enjoy in our huge main marquee tent, that is always bouncing! We're always looking to improve and next year's festival will have an even bigger and better stage, new improved sound and lighting, video screen, plenty of room to dance, loads of trade stalls, a fantastic array of scooters, top DJs, drink at the same sensible prices as this year, and a guaranteed value for money range of food. Unlike your average festival, SVF won’t empty your wallet. There are full 24/7 secure camping facilities, friendly staff, drinking water, showers and lots of toilets – all set in the beautiful Castle Park. Camping tickets for 2019 on the main Camp Sites A and B have already sold out, and we've just announced a limited number of tickets for Camp Site C, plus there's a few non-camping day tickets left, at great value for money prices. All tickets sold out last year though, so don't hang around to get them! As always, camping and day tickets will be strictly limited on a first come first served basis and tickets are flying out, with all camping likely to be sold out in the next couple of months. The small, dedicated team who run SVF, really care about the festival, and can promise you fantastic live music, scooters, a great, friendly, festival atmosphere, and a brilliant weekend that everyone can afford. We're really proud of SVF and we know you love it too. Don’t miss it and we’ll see you there! 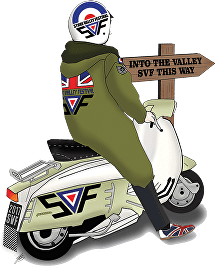 STONE VALLEY FESTIVAL NORTH'S FIRST 10 BANDS ARE NOW ANNOUNCED ON OUR LINE UP PAGE (CLICK BELOW) WITH THE LAST 3 BANDS ANNOUNCED IN EARLY SEPTEMBER.